We have all heard that "a picture is worth a thousand words." I suppose that might be why manga art comics have become so popular. 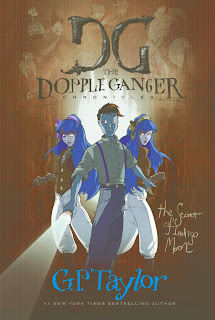 The Secret of Indigo Moon from The Doppleganger Chronicles by G.P. Taylor combines manga comics and novel in an interesting read for young adults. It is a good combination of the two that can encourage belligerent readers. The book follows the escapades of three youngsters who are labeled as troublemakers and seem to be in the right place at the right time to be unlikely heroes. The illustrations are well drawn. The plot is easy to follow and somewhat interesting. This book is the second in a series and frequently mentions events that happened in the first book. Since I didn't read the first, it was a tad frustrating. If you have a young adult that is interested in the genre, it is worth checking these out! This book was provided for review by Tyndale publishers. Glad you're feeling better girl! This thing hits hard, but so far everyone seems to be on the upswing today... I'm hoping anyway! Sounds like a good book! Thanks for the review!